Michael J. Sullivan has been tapped to head the ATF. The confirmation of US Attorney Michael J. Sullivan as head of the Bureau of Alcohol, Tobacco, Firearms, and Explosives was thrown into further doubt yesterday, when a Republican senator who is blocking the nomination renewed complaints that Sullivan has refused to loosen licensing rules for guns. The development means that the future leadership of the US attorney's office in Boston will remain cloudy for the foreseeable future, because the Bush administration has been unable to nominate a replacement. For now, Sullivan is performing both roles while his nomination is caught in a crossfire over gun policy. Senator David Vitter of Louisiana said yesterday that he met with Sullivan late last year to discuss what Vitter described as burdensome regulations imposed on gun owners and dealers by the bureau, which Sullivan has led as acting director since September 2006. Vitter asked Sullivan to address the concerns in writing. "I recently received his answers to those questions, and I was disappointed in his responses, so I am going to continue to hold this nominee," Vitter said in a statement released to the Globe. "The nominee seems to support the ATF's current inadequate policies and exhibits a lack of willingness to address these problems." Vitter's office did not release Sullivan's response, but the senator said the bureau holds gun dealers and owners to unreasonable licensing standards and subjects them to severe penalties if they make errors in paperwork. Under Senate rules, a single senator can put a hold on legislative action for months. Vitter and two Republican senators from Idaho, Larry Craig and Mike Crapo, have held up Sullivan's confirmation since December, saying the bureau is overly aggressive in enforcing gun laws. Craig and Crapo sent Sullivan a letter Jan. 22 posing ten questions, including some about ATF's treatment of small gun shops in Idaho, and are awaiting a reply. Craig's spokesman, Dan Whiting, said this week that the senator's objections have less to do with Sullivan than with the ATF, saying that small gun dealers have viewed the bureau with mistrust since the Clinton administration. Whiting said Craig feels the best way to register his concerns with ATF is "with the leverage of moving a nominee through the Senate." In response to Vitter's comments yesterday, Christina DiIorio-Sterling, a spokeswoman for the US attorney's office, said in a brief writtne statement that Sullivan respects the confirmation process and "will continue to be responsive to all questions or concerns by the Senate." The lack of movement also raises questions about the future of the US attorney's office and whether a permanent successor to Sullivan is likely to be appointed before a new president takes office in January. Several lawyers have been mentioned in legal circles as potential successors, including Michael K. Loucks, a career federal prosecutor who has been acting US attorney when Sullivan is in Washington; Assistant US Attorney Brian T. Kelly; and Roberto M. Braceras, a partner at Goodwin Procter and a former Justice Department trial lawyer. Trey Bohn, a White House spokesman, said President Bush remains committed to Sullivan and scores of other nominees who are awaiting Senate confirmation. On Feb. 7, Bush appeared with some of the more than 180 people he has nominated for federal positions and said the confirmation process has "turned into a never-ending political game where everyone loses." Senators Edward M. Kennedy and John F. Kerry of Massachusetts have both urged their colleagues to confirm Sullivan, whose nomination was approved by the Senate Judiciary Committee in November. After Crapo and Craig put holds on Sullivan's nomination the following month, Kerry said he was "disappointed that his nomination is now in jeopardy simply because he has responsibly enforced our country's laws." A Kerry spokeswoman said yesterday that his position is unchanged. Melissa Wagoner, a Kennedy spokeswoman, said that "this is a dispute between the president and members of his own party." She said Kennedy hopes that a Democratic president is elected in November and can fill both the positions of ATF director and US attorney soon afterward. Sullivan was named US attorney by Bush a week after the Sept. 11, 2001, terrorist attacks. As US attorney, he has honed a reputation for being particularly tough on drug and gun cases. But at least two federal judges have criticized him for focusing on cases that they said could be handled by state prosecutors. In addition, a Globe story in October reported that Sullivan has brought fewer criminal cases almost every year since he was appointed as US attorney and that white-collar prosecutions in particular have fallen. 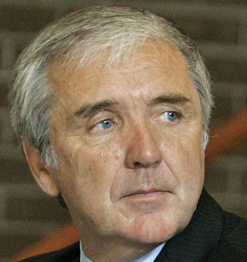 Sullivan disputed some of the statistics and said several factors have hampered him, including staff vacancies that he could not fill as a result of budget cuts.